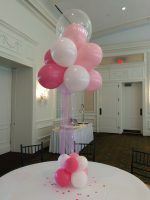 Balloon decor for every occasion! From the White House to your house. BBYO Passport represents BBYO’s groundbreaking initiative for Jewish travel and service learning experiences. Organized in partnership with Authentic Israel, a leading educational travel provider, BBYO Passport combines the best of informational education and travel expertise. Take the first steps of your new life together at the stunning redesigned Bethesda Marriott. With a professional events and catering team on hand, and freshly updated space, you’ll have everything you need to bring your dream day to life. Carbone Entertainment is an event agency that specializes in pairing you with the perfect artist, performer and activity to make your party that much cooler. Beautiful, sensitive B’nai Mitzvah and family photography by one of the area’s top photographers. Great customer service, great advice, very friendly. Over 15 years experience. Custom cakes, wedding cakes, and cookies. Allow me to create a fun and memorable event to celebrate your big day. Since 1995, I’ve been a DJ, MC and coordinator at over 1,200 parties. Enhance your affair with dance floor lighting, room uplighting, party motivators, the Silhouette Screen, Mitzvah montage, Pucker Powder, tchotckies and more. The music and entertainment reflect the importance of your upcoming affair. So book your date with DJ Mike On The Mic and leave everything to me. Bar and Bat Mitzvah, event, and wedding photography.